The Volkswagen Beetle is renowned as an automotive style icon with, perhaps, the most well-known silhouette of any modern car. Original Beetles have been modified in small numbers over the years to suit specialist drivers’ requirements and among the most famous of these are the ‘Baja Bugs’ vividly associated with west coast America. Now the spirit of those original conversions is rekindled in the modern Beetle range with the UK showroom debut of the exciting new Beetle Dune. 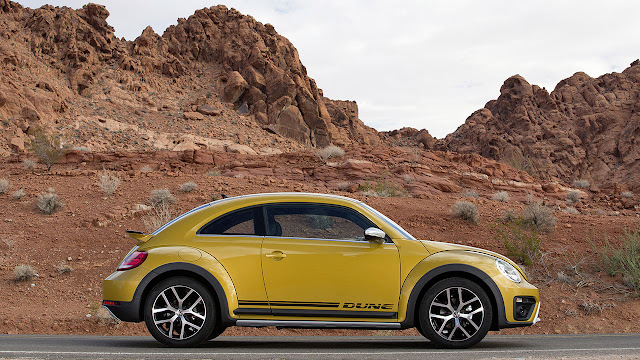 Engineered and styled to pay tribute to those off-road heroes, and with a ride height raised 10 mm compared with the standard car, the Beetle Dune is designed to offer a vibrant new dimension to the existing Beetle line-up. 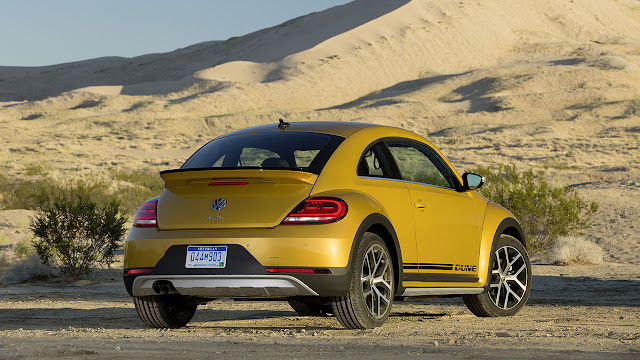 Available to order from 5 April through the Volkswagen UK Retailer network, the Beetle Dune’s rugged looks are enhanced via 18-inch ‘Mythos’ alloy wheels, front and rear wheelarch extensions and bold new bumper designs. 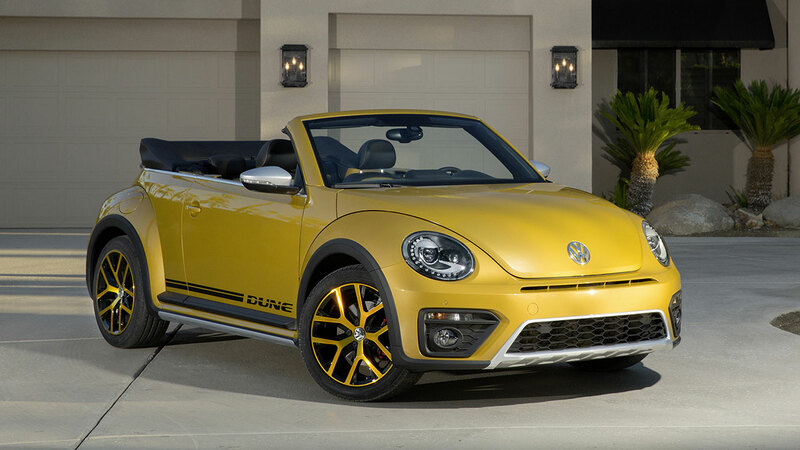 Beetle Dune customers have a choice of Coupe or Cabriolet versions and deliveries of both will begin in June, while a selection of five body colours complement the car’s eye-catching styling. The Sandstorm Yellow metallic and Dark Bronze metallic, in particular, have been developed exclusively for the Beetle Dune. Other colour options include Deep Black pearlescent, Black (non-metallic) and Pure White (non-metallic). Parts of the dash and door panels also share the exterior body colour. Indeed, styling inside and out helps the new car stand out from the crowd. Its adventurous character is emphasised by a large silver-framed central air inlet and a black honeycomb grille. In profile, the black wheel well and body extensions contrast with the eye-catching paint colours. In addition, black side trim strips – stylised ‘Beetle running boards’ – and ‘Dune’ badging underscore the dynamic image of the latest Beetle. At the rear, a large spoiler and new LED lights create a futuristic look. 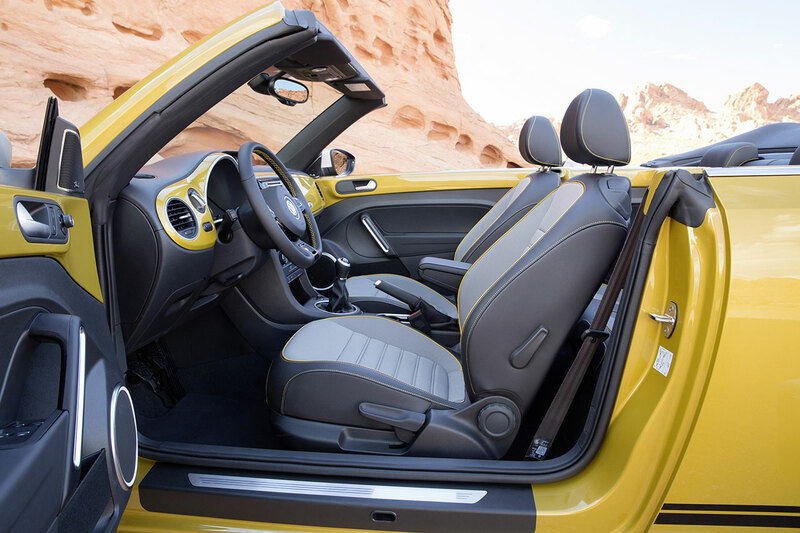 Inside, extensive use of contrast ‘Turmeric’ stitching on the sport seats, leather-trimmed steering wheel and parking brake grip help define the new Dune while contrasting areas of the seat system, door trim panels, roof pillars and headlining are finished in black. The generously equipped new Beetle Dune is based on the existing Beetle’s Design trim level which means a comprehensive selection of technology and creature comforts as standard. Among the highlights is the Composition Media system which includes 6.5-inch touch-screen with Bluetooth telephone connection, DAB digital radio receiver, dash-mounted single CD player, MDI (Multi Device Interface) via USB connection, SMS messaging functionality and eight speakers. Standard-fit technology also includes a Light and Sight pack comprising auto dimming rear-view mirror, automatic headlights and rain sensing wipers, while convenience is enhanced by ultrasonic parking sensors front and rear. 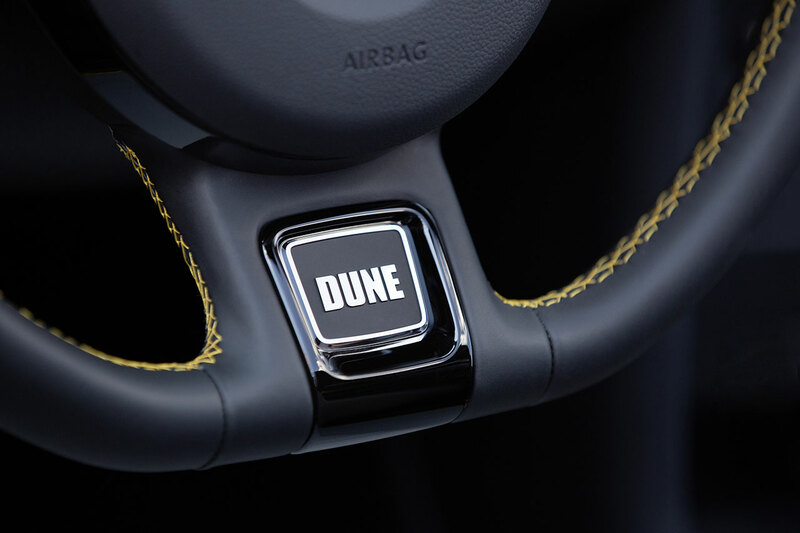 A multifunction leather steering wheel with decorative 'Dune' insert and contrast 'Tumeric' stitching, leather-clad handbrake with contrast stitching and carpet mats front and rear with 'Tumeric' contrast stitching continue the Dune’s bespoke look. ‘Climatic’ semi-automatic air conditioning keeps things comfortably cool inside. Safety is enhanced via ABS (Anti-lock Braking System) and Electronic Stability Control (ESC) fitted as standard and the Beetle Dune Cabriolet has rollover protection. 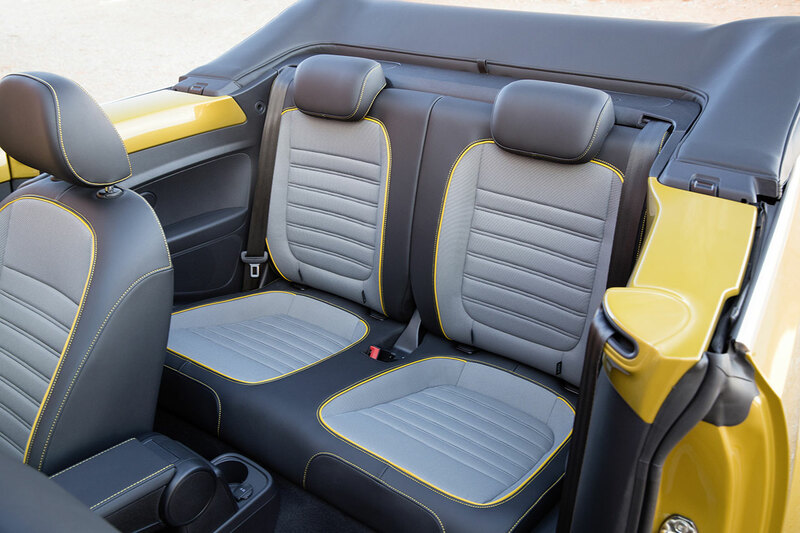 In addition, all Beetles have Isofix child seat preparation for two rear child seats, tyre pressure loss indicator and a comprehensive suite of airbags. The Beetle Dune is powered by a choice of two engines. The 1.2-litre petrol TSI engine develops 105 PS and is available with either a six-speed manual or seven-speed DSG gearbox. With both options, the hatch model accelerates from 0 to 62 mph in 11.3 seconds. 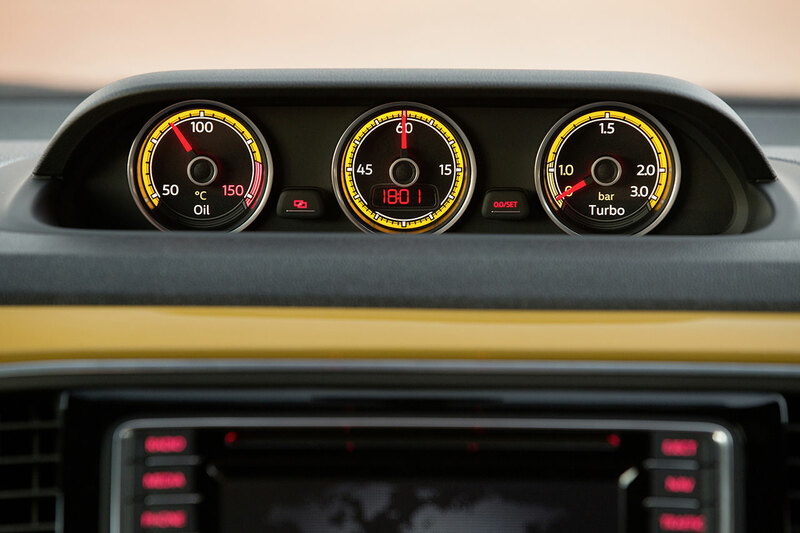 The 2.0-litre TDI develops 150 PS and comes with a choice of six-speed manual or six-speed auto DSG gearboxes and, in the hatch version, reaches 62 mph in 9.2 seconds. Top speeds, where legal, vary from 110 mph for the petrol manual to 124 mph for the diesel manual. Fuel economy ranges from 51.4 mpg (combined) for the 1.2 TSI manual to 62.8 mpg (combined) for the 2.0 TDI manual while CO2 emissions range from 117 g/km to 127 g/km depending on engine and gearbox choice. Today’s production Beetle Dune was presented to the world as a concept car at the Detroit Motor Show in 2014. The concept’s off-road interpretation of the classic Beetle design attracted global interest, and was itself a highly successful development of an earlier concept car revealed in Los Angeles in 2000.